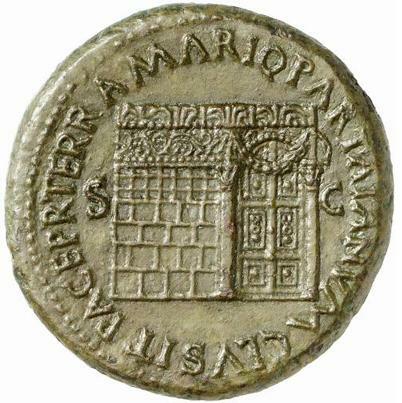 Janus was the Roman god of doors, choices, beginnings and endings. The first month of the year is called January after him. He is usually depicted with two faces, one on each side of the head. He was one of the earliest gods of Rome, sometimes referred to as the “god of gods” or diuom deo. 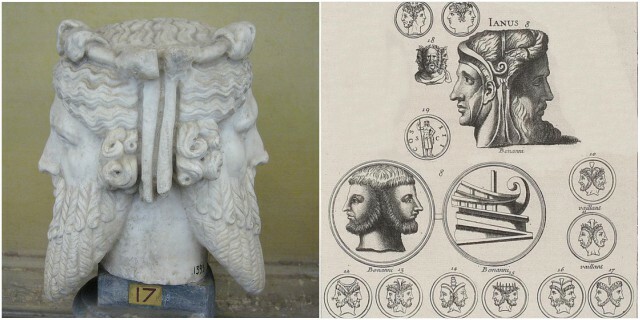 He is often shown with beards on both faces, but originally, Janus was depicted with one bearded face and another one clean-shaven, which may have symbolized the moon and the sun, or age and youth. Occasionally he was depicted as four-faced – as the spirit of the four-way arch. He looks both towards the future and the past at the same time. One face looks back to the year departed, and one looks forward to the new year ahead. Janus was a porter of heaven and a guardian god of gates and doors. He was the Roman God of Beginnings and his name was an obvious choice for the first month of the year. 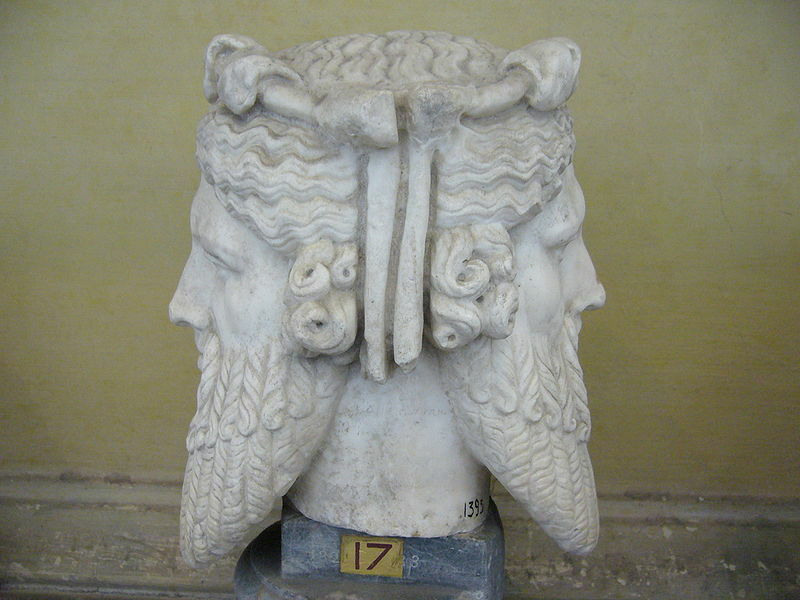 The origins on Janus vary and unlike other Roman and Greek gods, Janus may have been a mortal who came from Thessaly and was welcomed into Latium by Camise. They got married, shared the kingdom and had many children together. 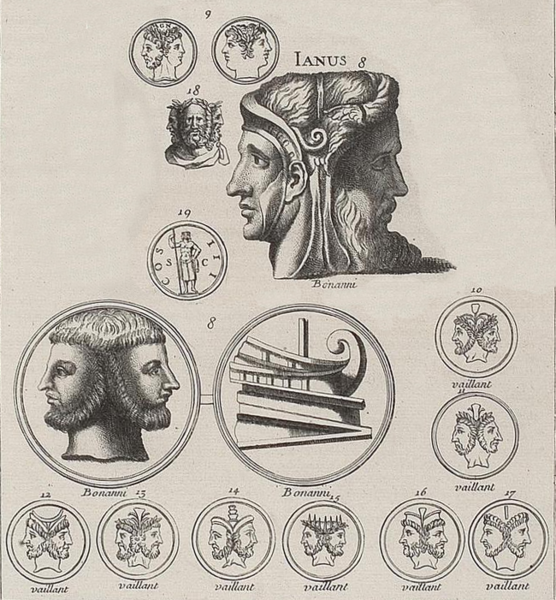 As the ruler of Latium, Janus presided the Golden age, introducing money, laws, and agriculture. When Camise died Janus became the sole ruler and peacefully ruled Latium for many years. In the second myth he is present in Rome at the time when the city founder, Romulus, and his men kidnapped the women of Sabine, and the men of Sabine attacked Rome in retaliation. When they attempted to climb the Capitoline Hill, Janus launched a powerful jet spray of hot water, forcing them to retreat. As a result, Numa (the second king of Rome 715-673 BC) erected a temple known as the Ianus geminus in Janus’ honor. It was a double-gated structure (one door facing the rising sun and the other, the setting sun). During the periods of war, the gates were left open so he could assist the Roman soldiers in time of war and shut again during times of peace. The gates were shut only once between the reign of Numa Pompilius (who reigned 715–673 BC) and Emperor Augustus who reigned until 14 AD. Janus also had a temple on the Forum Olitorium constructed in 260 by C. Duilius for the naval victory of the Punic War and another one on his hill, the Janiculum. Janus was one of the earliest and well-respected Roman Gods whose dual face can be easily recognized on many Roman coins and city gates.